So I have a confession to make. It’s about this whole Paleo journey and staying true to it and true to myself. People ask how I do it, how I don’t cheat, how I stick with it. The answer is that I am not perfect. I love sweets and sometimes my sweet tooth gets the best of me (for instance, I am making salted caramel double chocolate brownies today). I also love fish tacos and coleslaw, and sometimes legit corn tortillas happen. I do have a strong why though and a strong support system that helps me to stay on track. My why, let’s talk about that for a minute. I have MS, and it gives me motivation to help my body to be as healthy as possible. Knowing that I have a condition that thrives on inflammation gives me some mental toughness to fight back and make it really hard for my body to work against itself. I like to be really good at the things I do, and there’s nothing more personal and important to me than making sure I stay healthy and fit (mentally, physically, and emotionally) for a very long time. Justin is all in with me, and that makes it so much easier. With my family and Justin in the fight with me, I have a strong network and support system to keep me going on the days when my own resolve waivers. On days I want to cheat with some authentic fish tacos, honestly, I figure it’s not the end of the world if corn tortillas are my big cheat, especially if they are authentic and made with quality lard. Anyhow, I recently found a company called Siete Family Foods, which has created paleo-friendly tortillas made with almond, coconut, and cassava flours. We found them on Instagram initially and then in our local Whole Foods. What a treat to be able to have guilt-free paleo fish tacos and coleslaw! This is an unsolicited review of their product. We are not being compensated. Both Justin and I were just so excited to be able to eat fish tacos, at home, in a tortilla. To boot – they are tortillas that stayed together and acted like a tortilla should with a similar consistency and texture to traditional corn tortillas. We have been so busy with our move(s) (yes – there are multiple moves involved) and preparation for our next adventure, so any time savers we can find in the kitchen right now are welcome, and these tortillas are hands down a new favorite! We’ve had them multiple times over the past few weeks! Our paleo fish tacos and coleslaw are made with cod or halibut (use a flaky white fish), and they are best when you prepare the seasoning mix and let them marinate for at least one hour before you cook the fish. It’s a simple blend of spices that yields a masterful flavor punch. The coleslaw is made without mayo, and is a light, zesty, and crunchy topper to your tacos. Now I just need Siete Family Foods to make me some tortilla chips to make this meal complete! Hint, hint, wink! 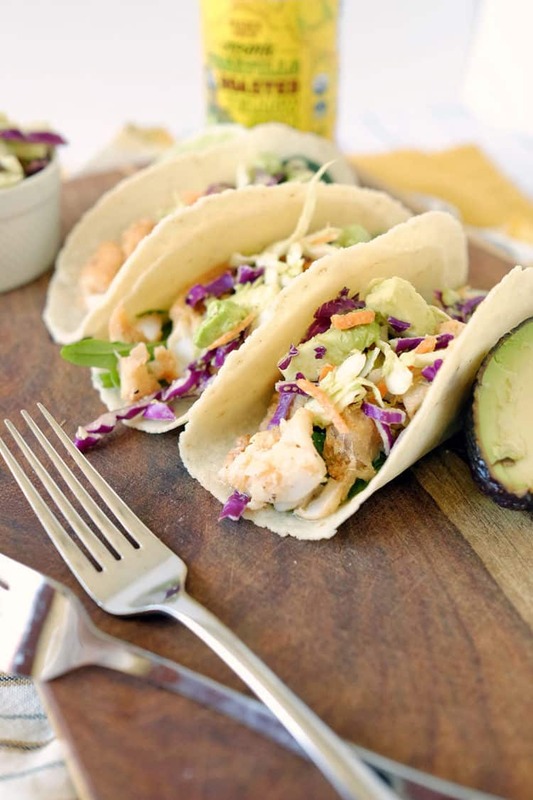 Try out these paleo fish tacos and coleslaw, and let us know what you think by leaving a comment below and adding a rating. Also, take a picture and tag it on Instagram @realsimplegood so we can check it out! Place all of the seasonings for the fish tacos in a small bowl and mix until they are evenly combined. Place your fish in a ziplock bag and then add the seasoning mix. Close the bag and use your hands to get the seasonings to coat the fish. Place in the fridge, and let your fish marinate for at least an hour. 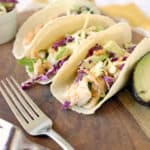 Make your coleslaw before you start cooking your fish because the fish won't take long, and you'll want to plate these tacos and get to eating right away. For the coleslaw, just place all of the coleslaw ingredients in a small mixing bowl and mix them up until the avocado gets a little broken down but stays mostly chunky. Set aside till you're ready to plate. Heat a large skillet over medium heat and let your butter or ghee heat up and melt in the pan. Transfer your fish from the ziploc to your heated skillet. Let the fish get to sizzling. Cook for 2-4 minutes. While the fish is going, heat up your tortillas. Just pop them in a medium skillet one at a time, right before your fish is done. They only need to be heated up for a minute or less. If you get them too crispy they will fall apart - lesson learned one time we made them. Flip or mix the fish pieces around to get the other sides. Cook for another 2-4 minutes. Turn your burner off once the fish is done. It will be flaky. Plate your tacos. Layer your fish and then coleslaw right on top of your tortillas. Garnish your favorite toppings, like salsa and cilantro. We also like to add a dollop of chipotle lime mayo from Primal Kitchen (it's addicting). 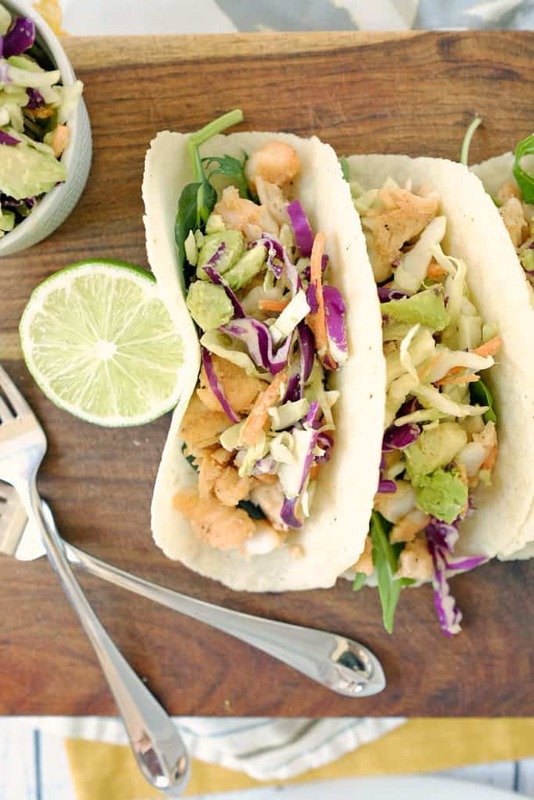 Devour these paleo fish tacos and coleslaw! It's like bite after bite of a vacation in Mexico right at your own dining table! This fish was soooo good. My teens who hate fish didn’t complain in the first time in forever! Made the coleslaw with leftover poppyseed dressing for a slightly seeet flavor to the meal. Placed on fried Casava tortillas and ate like a tostata. Saving this recipe and will make again! Thanks! My husband and I enjoyed this recipe. The slaw was a little to tangy with only lime and as a remedy I added several drops liquid stevia and sprinkled some diced red peppers over a helping on the plate. Pretty extra color as well. A perfect pairing with sweetness against the spiciness of fish seasonings. We even omitted serving in tortillas. We will be making this again. Delicious!! !